Do you feel ineffective, incapable and unlovable? When you are under a lot of pressure at work or having a difficult time with someone in your family or when someone insults you, do you talk negatively to yourself, like "I'm no good"? Do you find it difficult to feel good about yourself? Do you feel worthless when you make mistakes or when others insult you? Do you feel so bad about yourself that you do something to hurt yourself or someone else, such as getting drunk or yelling at your children? Feelings of low self-esteem are not reality-based, but grounded in internalized rejecting and critical messages. 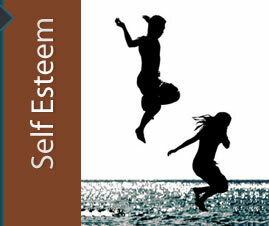 Self-esteem is a pervasive theme in therapy because it is foundational to how we function and how we relate to others. Social anxiety is the cycle of low self-esteem, social avoidance/isolation, and depression. Very shy people often have a personal history of ridicule and judgment that makes them believe they are "different from everyone else". They feel handicapped in their ability to seek help, to make contact with others, and form intimate relationships. They feel completely inadequate in a wide range of social skills that most people take for granted.